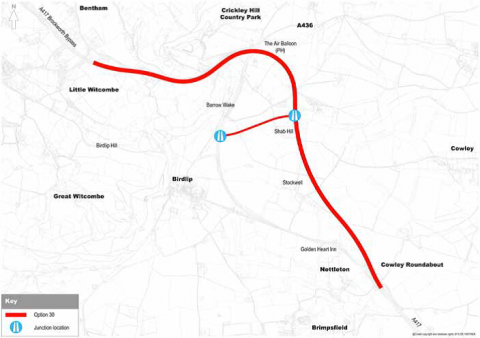 Highways England is seeking your views on the proposed route options for the A417 missing link. The consultation ends on 29th March 2018. The consultation brochure can be found here. 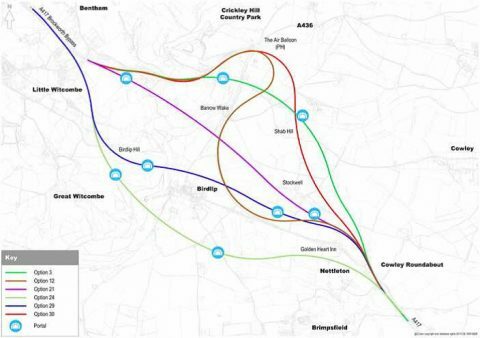 It explains the six possible options that have been developed, including several more environmentally friendly routes involving tunnels. But only the two surface options shown below have been taken forward for public consultation (options 12 and 30). Further information and the online survey can be found here on the Highways England website. Option 12 seems to be better as it appears to use more of the original road and is not cutting into virgin countryside. I does seem really naive and stupid to reject the best solution i.e. a tunnel. Considering the money that has been wasted in lost time on journeys and lives that have been lost over many years it is exceptionally dumb. The reason that we are at this point is that a decision to drive the dual-carriageway through when the A417 was rebuilt some years ago was short-sighted and based on a PFI. So now we are being offered a ‘cheap’ solution that has danger built into it; why else would you talk about 50 mph speed restrictions before building starts. And what about the disruption to the ANOB? Shame we allowed the Spanish to build so many massive tunnels in Alt Emporda so as not to spoil the scenery. Oh but that was EU (OUR) money!